I was out of bed at 4:15 am Sunday morning to take part in the Charlotte Spring Bird Count. By 5:30 I was at Renaissance Golf Course and ticking off the first species; American robins in full dawn chorus. It wasn’t long before things got more interesting though. A pair of barred owls started hootin’ it up at dawn and the neotropics began adding to the chorus. Newly arrived Eastern kingbirds, orchard orioles, indigo buntings, and blue grosbeaks were all accounted for. 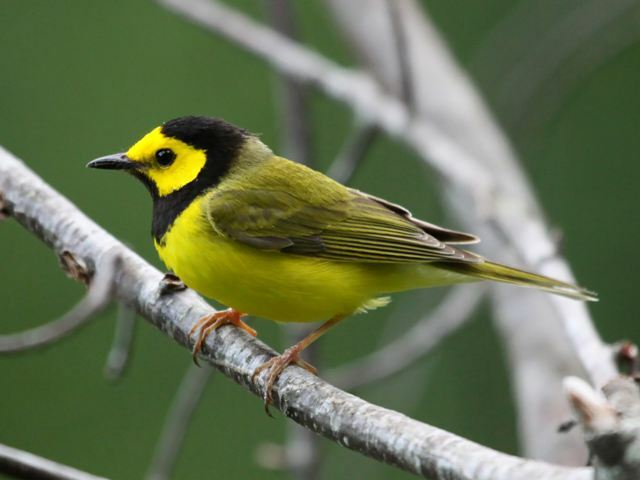 Birders like to keep a separate list of how many warblers get tallied on spring outings and as usual, the golf course delivered. After three hours 18 species of warblers were tallied including Cape May, worm-eating, hooded, palm, American redstart, ovenbird, Northern parula, pine, black-throated blue, yellow, yellow-rumped, yellow-breasted chat, common yellowthroat, blackpoll, black and white, prairie, Northern waterthrush, and Louisiana waterhrush. That’s a healthy total anytime. Add scarlet and summer tanagers; and a stunning male rose-breasted grosbeak and it made for a great morning. 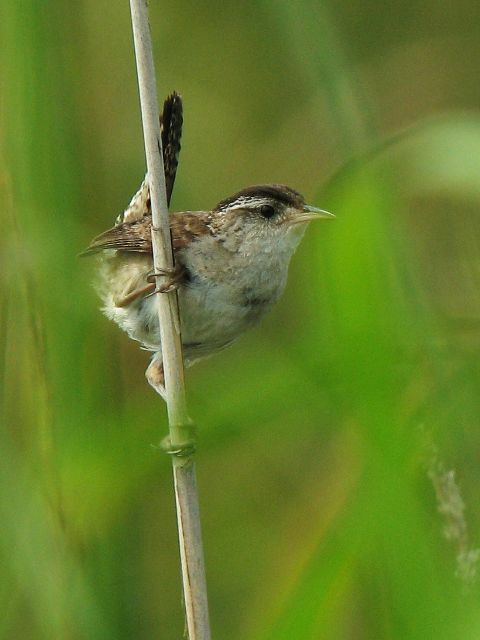 A marsh wren sang lustily from a small wetland, the fourth straight year that this uncommon migrant has been in that same spot. Next I checked out an interesting looking field right off Tyvola Road at the new City Park development. I was very surprised to hear the distinctive insect-like buzz of a grasshopper sparrow and I was soon able to find the tiny sparrow perched at the top of a pine sapling. Grasshopper sparrows are tough to find nowadays in Mecklenburg County due to disappearing habitat. I didn’t see a female but I hope he will be successful in attracting one. A pair of killdeer went into a defensive display, obviously guarding and unseen nest somewhere in a gravelly patch of ground. I checked some small ponds in close-by business parks and was able to locate up to five spotted sandpipers teetering along the shorelines. Those spotteds and the aforementioned killdeer were the only shorebirds seen that day, a little bit disappointing. Hooded warblers love shady damp lowlands. A few breed in Mecklenburg County but they are most numerous along the coast and in the mountains. 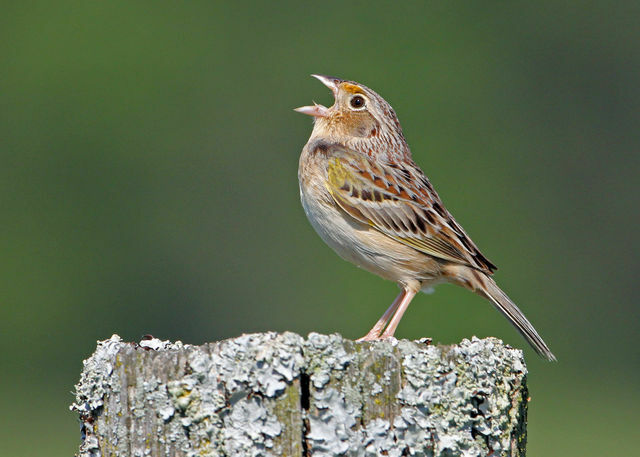 Grasshopper sparrows are declining nationwide due to habitat loss as small farms and pastures disappear. 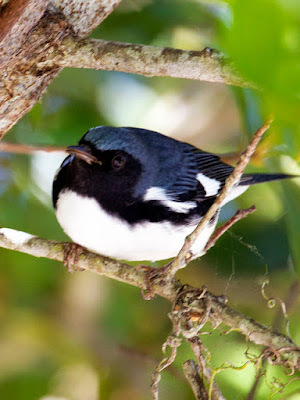 Black-throated blue warblers nest in our mountains, but are one of the more common migrant warblers that pass thru. the piedmont.